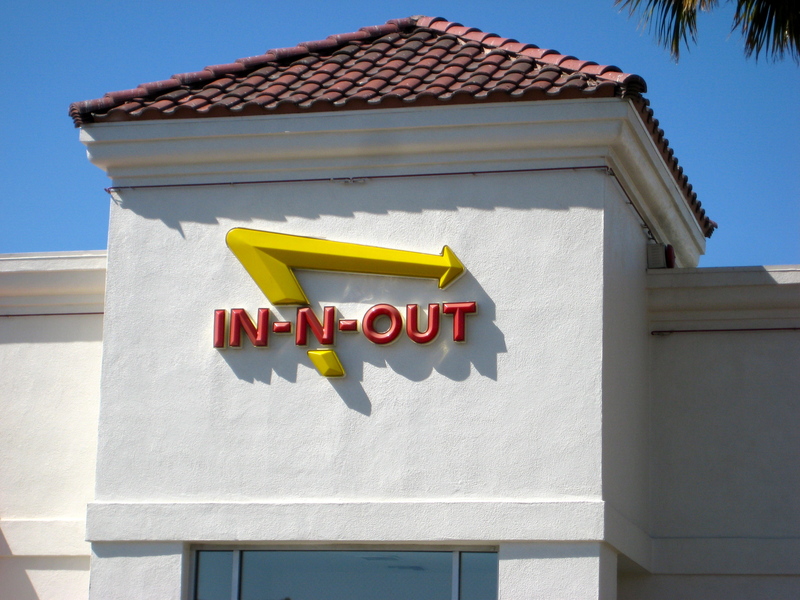 I’ve been “In-N-Out” and off the blogging “grid” a few weeks now. To be candid it was a nice break! Sometimes it feels like we’re leashed to technology. Smart phones and tablets make it easier to stay connected while you’re out on holiday — but that same technology also makes it tougher to truly “get away from it all.” Some might say they have no choice and like that it makes them feel busy. Indispensable. If you’re wondering if I’m still employed? Thankfully, yes! California is the poster child of the typical laid back summer day, but the In-N-Out vibe is efficiency. There are three cashiers. And each and every one of them is focused on a customer. There’s no BS’ing between them, no talk of last night’s date. No cell phone or texting. You see they’re well-trained and they want that upward mobility, In-N-Out promotes from within. And to say the meal is satisfying would be an understatement. It wasn’t only the food that mattered. You feel like you belonged. I didn’t need to check in, I didn’t need to cough up my e-mail address, I didn’t need to show a “points reward card” and no one badgered me, there was just a feedback loop between worker and customer, that we were enlightened, that we were doing it a better way. And speaking of enlightenment… during my travels over the last couple of months I spent time in a half-dozen or so Harley-Davidson dealers. And I’m wondering if the Harley-Davidson “close-to-the-customer” philosophy is waning? To my way of thinking the In-N-Out model is what the American business should be. You make a good product, and you keep to it, you pay and take care of your workers and they give back. It should never be about how much profit can be squeezed out of every corner or how do we capture every demographic in all the mature and emerging worldwide markets. As is the case with In-N-Out, just make a good product and keep it up and the money will follow. Be great at a few things instead of OK at all things. Quality is key, and keeping up quality is what makes In-n-Out work. It’s the same now as it was back when it started. Is there anything like that now? Sure not every Harley dealer is equal and many are more than just a retail outlet. They are often a gathering place where riders come to trade stories and talk with others who share their riding passion. But, as example the gal in the Durango H-D dealer was too busy talking on the phone about her boyfriend issue to answer a question. Yeah, she got around to my question eventually, but not before finishing the call. Or how about the stop at Timpangoes H-D where the salesman must have been so busy mixing his coffee to notice that we just rode in on motorcycles before starting in on his “what’s it gonna take to get you on a new bike” script… The aggressive push by the motor company and the retail strategy to establish a collection of products all linked under a common visual identity – means that sometimes there’s a disconnect between the simple atmosphere of where you feel like you belong vs. how everyone who walks through the dealer door is viewed as a commercial target/opportunity to extract dollars. In-N-Out is the real deal. And given the mixed press assessment of the Harley-Davidson 2013-model year bikes (little to stimulate excitement other than a new paint scheme), H-D dealers could learn something on the customer service front by modeling the cashiers at In-N-Out. Photo taken by author and courtesy of In-N-Out. I love Costco and I hate Costco. My displeasure is often traced to other people who shop there? They say membership has its privileges and I’ve seen the people who flaunt it to no end. A person is lucky to not get run over by a Range Rover or Lexus SUV in the parking lot. You know the type… these people are “entitled.” Their lives are more important. Their jobs are more important. Their kids are more important. They’ll cut you off in a heartbeat in the candy aisle with their overloaded carriage to grab a lifetime supply of Juicy Juice. They are not to be denied! Costco is not cheap. They are not about immediate dollars and cents, but about the long haul relationship. They specialize in getting you to spend money on stuff — much of which you didn’t know you needed or wanted until you went on a “walk-a-bout” in the store. What they do leave you with is a good feeling that whatever you spent or bought – you got real value for your money. And I’m not just talking about the Hebrew National hot dog for $1.69! The benefits go much deeper. Did you know that they have a nearly unlimited, no-questions-asked return policy? They sell movie tickets at discount? They offer great prices on optical products and testing? They have cheap, high quality gas. They sell tires for less than most tire shops and offer warranties on them beyond the manufacturer’s warranty, at no extra charge? They have buyers in retail, screening products for quality and meeting (sometimes even anticipating) consumer demand, perfectly in most every product category. So here’s the question. Why doesn’t Harley-Davidson partner with Costco to sell motorcycles? They could leverage the existing Costco Auto Program which saves consumers money, time and hassle on new vehicle purchases or leases. In addition the Costco field staff selects participating dealers that offer up competitive pricing and superior customer service. I’m thinking how great is that? Consumers do not trust advertising, they don’t want to view advertising and they don’t need advertising. H-D could save all that money on slick ads that try to entice customers who don’t care – it’s a complete waste. Why do you need advertising when you’ve got Costco? Dedicated Costco shoppers salivate when they speak of their store of choice. They bring it up unsolicited, as a topic of conversation, akin to computer-users testifying about their Macs. The everlasting love makes you want to avoid Costco and Apple at first, but then you have an experience and you’re converted. So instead of H-D beating us over the head telling us how great their motorcycles are, why not go the non-traditional route and appeal to the populace on sheer quality. Costco cares about its customers. It knows their needs. And it wants to deliver the very best for the very cheapest price. We’re all willing to pay the most for something great especially if you believe it’s a fair business proposition. Are you listening Harley? And to the lady who picked up pain relievers in the ten-gallon jar and placed them in the cart with the only other item — a pile of condoms, which came in a box the size of a cinder block…I’m sorry for staring, but the dichotomy was funny!